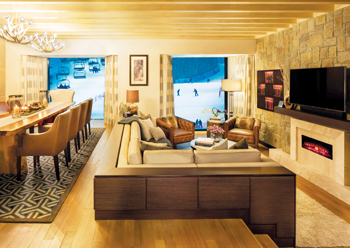 Earlier this year, Majid Al Futtaim (MAF) and Kempinski Hotels unveiled the Aspen Chalets at Kempinski Hotel Mall of the Emirates – the pinnacle of the hotel’s $100 million refurbishment project – and TTN was invited to test the product. The Chalets, touted to be a ‘hotel within a hotel’, comprise 15 luxurious Aspen Ski Chalets and five Aspen Pool Chalets connected directly to the hotel’s infinity pool, marrying snow and sand in perfect harmony, offering views of the snowy slopes of Ski Dubai on one side and the sparkling Arabian Gulf on the other. The Aspen Ski Chalets hit the nail on the head with their super comfortable, ski-lodge feel – complete with a crackling (faux) fireplace, hot chocolate with marshmallows, soft furry blankets, heavy-duty natural wood furniture, stone and marble. You really could be fooled into thinking you’re in Rocky Mountains, Colorado, until you step out of the hotel and straight into shopping nirvana with Mall of the Emirates. The retail experience is so easily accessible and devoid of stress, and just as easy to break away from when you’ve had enough. Besides, there are entertainment options outside the hotel’s tennis courts and infinity pool – several cinema screens to choose from (with Michelin-starred Gary Rhodes’ menu!) and play options for kids. Not to mention Ski Dubai itself, which is as much a part of the Aspen Ski Chalets experience as the fur-adorned sofa you sit on, to enjoy the view of children, both old and young, frolicking in the snow. Located on the second floor of Kempinski Hotel Mall of the Emirates, the Chalets have a separate, discreet entrance and offer round-the-clock butler service. The rooms, which all come with access to the exclusive executive lounge, feature spacious marble bathrooms and luxurious Hermès amenities. Tech-lovers will indeed be thrilled with the state-of-the-art Bose sound system, iPads and large LED TVs. There are a variety of chalets to suit couples and families, including one, two, three bedroom or duplex Aspen Ski Chalets, or one bedroom Aspen Pool Chalets. This section of the hotel is certainly ready for the Arab family market, so don’t miss the opportunity to get your GCC clients here. Although MAF has taken the indoor ski concept to Riyadh in Saudi Arabia and Cairo in Egypt, Ski Dubai is still very much a unique concept and there will be takers for this experience in the region. A host of dining options are available for Aspen Chalets guests, not least of which are the hotel’s dining outlets – Olea, Salero Tapas & Bodega and Noir. A special in-room dining menu is available 24 hours a day, and the executive chef can cater to private dining requests, including full butler and table service.